Our commercial-grade Tire Pressure Monitoring System (TPMS) drives down costs and improves safety via in-cab notifications on tire pressure and temperature. 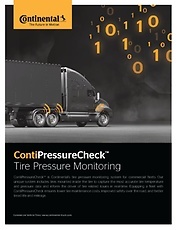 See tire pressure and temperature data for every vehicle in your fleet in a single web portal. Increase uptime, reduce maintenance costs, and maximize fuel savings. Compliant with pending GHG2 regulations, our trailer TPMS features a low-cost installation process. Watch the video and learn more about our digital tire management platform. Want to learn more about our innovative TPMS and remote tire monitoring solutions? Click here to complete the form.